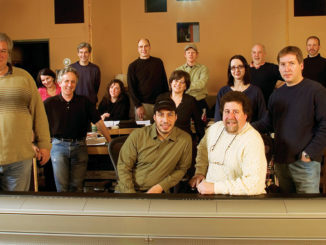 Sound Lounge Lizards: Front row, from left, Paul Urmson, Tony Volante, Blake Leyh; back row, Igor Nicolic, Nicholas Renbeck, Sound Lounge audio post supervisor Travis Call, Suzana Peric and Nancy Allen. Cinema, still a relatively new art form, seems to need––even desire––a good fight over its central tenets on a regular basis. Back in the 1920s, Soviet experimentalist Dziga Vertov was already calling for a radical new cinema unlike Hollywood, followed by other manifesto wavers ranging from the nouvelle vague of Jean Luc Godard, François Truffaut et. al., and their documentary compatriots in the US (Robert Drew’s ‘Direct Cinema’ advocates the Maysles brothers, DA Pennebaker and Ricky Leacock) to the most recent proclamations by Danish filmmakers Lars von Trier and Thomas Vinterberg, of Dogme 95 (their “rejection…of a concept of film as a work of illusion”). All such revolutionaries proclaim a return to a basic cinema language, unencumbered by an overreliance on elaborate, post-produced effects that distance both makers and viewers from a “true” cinematic experience. So what does all this have to do with making a film in 2008? 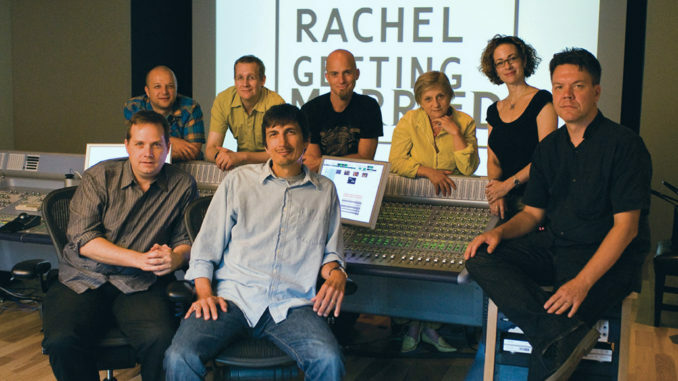 Only that director Jonathan Demme put his talented sound design and editing crew up to a similar Dogme 95-style challenge for his latest feature, Rachel Getting Married. The romantic comedy, selected for this year’s Toronto and Venice Film Festivals and opening October 3, features actors including Anne Hathaway and Debra Winger even while offering this idiosyncratic director’s own Dogme-like approach. “The Dogme manifesto was quite influential in Jonathan’s thinking about how to approach the film, for the sound, visuals, and acting,” says sound effects editor Blake Leyh. In Rachel Getting Married, a varied collection of musicians––friends and partners of the groom and his producer father––are preparing music for the aforesaid wedding ceremony and party. Together, they create a constant musical commentary heard throughout the film, whether on screen or off. 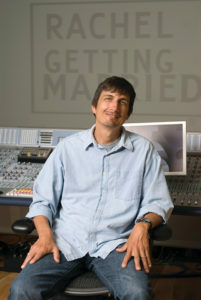 That might not seem at first like such a big deal, but with musician/actors strewn throughout the sprawling Connecticut house where 70 percent of the film’s action takes place, preparing and editing the audio, and then pulling everything together in a final series of mixes became a rigorous challenge to the sound crew. 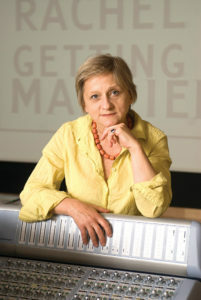 “The biggest challenge was organization,” admits Suzana Peric, music designer and music editor on the film. “After shooting wrapped, I was presented with a folder notating the 39 hours of music recorded on the set!” Every scene had music, either seen in the shot or heard off screen. While the Dogme group’s “Ten Commandments” could seem strict––though in a tongue-in-cheek way––”What we took from Dogme was very loose,” says Peric. Demme wanted lots of options, she reveals, yet each time the musicians performed, it needed to feel unrehearsed and of the moment. Even “guests” attending the wedding were actual musicians chosen by Demme. 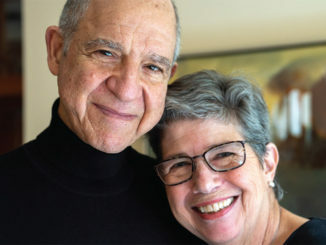 “He is well known for using a wide tapestry of music,” says Peric. Handling such complexity required a more open, flexible working style made in part by planning and careful pre-mixing, as well as hopping on to new trends in post-mixing. 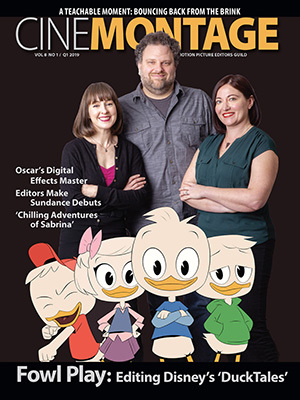 But planning can only help so much––especially in a film that had to feel loose and unrehearsed, yet was helmed by a music-savvy director who wanted to capture every improvisation. That led to mad dashes by the boom man around the set with very little chance to do standard slating. Since the movie was recording to high-definition tape systems, the camera was often kept rolling. 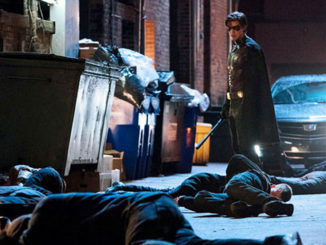 “Supervising dialogue editor/ADR editor Nick Renbeck and I started to hear reports back from the shooting, and we were just terrified,” says Paul Urmson, supervising sound editor/re-recording mixer. 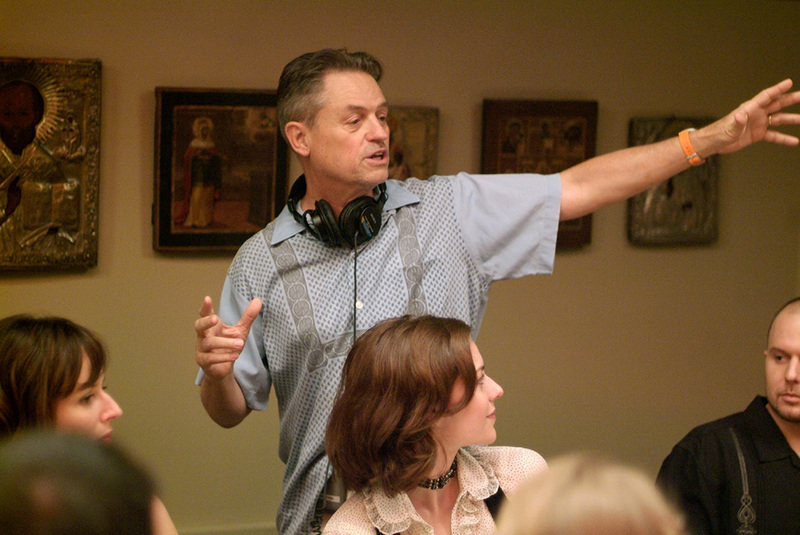 While Urmson had heard of the basic plans for shooting the summer before, he soon learned that Demme had taken to rolling through complete rehearsal dinner scenes for 30 minutes or more without stopping. 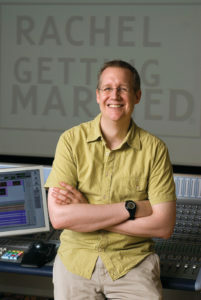 Added challenges from such unfettered scenes came to the sound department as well as the film’s picture editor Tim Squyres, A.C.E. ; both had to contend with wild footage taken by “wedding guests” supplied with prosumer camcorders with the charge from Demme to shoot whatever they liked. The task of making sense of the hours and hours of recorded music gave some of the greatest obstacles to Peric as music editor. One glitch seemed to face her with an especially daunting task at first: All of the music information was useless, since ingest for picture editing on the Avid systems renamed music tracks. “Just to find things that were in the cut and then identify them in my session [recordings] was a challenge,” says Peric. While the entire sound department worked on Digidesign’s ProTools, they weren’t able to benefit from sister company Avid’s OMF file data. At this past NAB, Avid announced that it would be making a greater effort over the coming year to better integrate the workflows of the two product lines. Considering the upside this would offer to Avid, many in the industry are surprised it has taken this long to get that expression of interest. The sound editorial department needed to manage up to 14 channels from the DEVA location sound recorder and up to an additional four channels from four possible cameras (including prosumer) running. Good collaboration saved the day. While the sound department did receive OMF material from the Avid picture editing sessions, assistant sound editor Nicolic reloaded the matching 4- and 8-track recordings “mostly so we could get away from the Avid sound file naming issues and access the metadata from the DEVA disk,” says Renbeck. 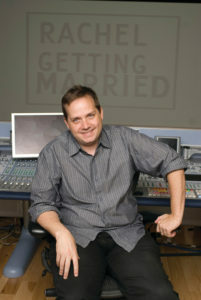 It all came down to Tony Volante, re-recording mixer at New York’s audio house Sound Lounge, to pull it all together. It was the right place for Demme’s sound team to end up as the facility offers a large mixing suite with a side-by-side dual Digidesign Icon soundboard. Incoming ProTools’ edited projects immediately integrate into the Icon’s large virtual mix surface. While such capabilities are fairly common in Los Angeles, Manhattan-based Sound Lounge makes claim to being the only facility on the East Coast to offer this much more flexible approach to mixing. Traditional film music pre-mix is usually done separately. 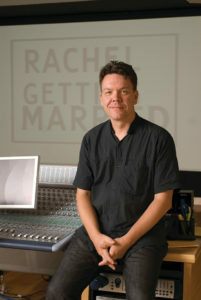 But the music in Rachel Gets Married is more like sound effects or dialogue; it had to be an integral part of the film. One approach was to create a sense of place as the characters move throughout the house. As they pass various musicians and their instruments, the music itself builds bit by bit into becoming its own entity. “These days, in our digital 5.1 surround world, you can go pretty crazy in panning things around your soundscape,” says Volante. “Our challenge was that we wanted the music to deliver a good aesthetic soundwise, but it still had to be coherent within the film––almost as if you could touch it like it was a character.” The cliché to stay away from, of course, was just to put things down the middle in mono. “Someone might think, ‘Oh well, everything sounds like it’s in the film since it’s all coming out of one place’––but that was too easy to do and, in the end, not as pleasing,” he adds. Meanwhile, a big, wide surround sound score would overwhelm the rest of this Dogme-inspired film. “The trickiest thing to do with the music was to find the right blend of space, to spread things out enough aurally within the surround to give a good experience [of the music], but not too much to distract you,” Volante explains. Having the music and sound change with its own perspective was another important element to better incorporate the music within the narrative. Robert Altman is the touchstone here, Volante agrees, in his genius of working with long takes that incorporated complex sound groups and spaces. One moment that shows the careful evocation of character and place comes in a long take that makes up an early scene: we follow the main character as she moves from her parked car, into the house and into the movie narrative itself. Changing the music’s perspective was key, says Volante, even though it was recorded initially at one location. “She first hears the music at a bit of a distance, coming from the house, and as she walks in––the music is getting closer, step-by-step––she goes from the entrance way up the stairs––the music is still growing––and she finally passes by a guitarist on the stairs.” The character continues walking up the stairway and the perspective changes again as she now moves further away. Challenges like this gave Volante the impetus to build a room that could take the complex work already done by sound designers on the ubiquitous ProTools, and move it right into the final mix. “I wanted a setup where I could bring their sound design right in from the hard drive, and bring up their session on a platform they’re already familiar with,” says Volante. With total access to all of a sound designer’s individual elements, it might be the ideal way to work, he feels. “My hands are never tied,” he concludes. To some, in the choice of the stripped-down approach of Dogme-style filmmaking it might appear that Demme chose to tie his own hands on the production of Rachel Getting Married. But the final result––a film that’s alive with a soundtrack as integral to the plot as any of the main characters—shows there’s still plenty of innovation possible as cinema begins its second century.